Netflix is a juggernaut of content, and they’re still breaking the mould. Just take Daryl Hannah’s Paradox, for instance. Who could’ve guessed the streaming service could turn your living room into a snooty arthouse theatre? That’s a flippant comment but, boy, is Paradox excruciatingly smug. How do you rate or review this movie? Is this even a movie? Hannah’s indescribable directorial feature debut is a showcase of disconnected video that’s cobbled together through vague themes and experimental filmmaking. Some mangy outlaws are lead characters, I think, as they riff back and forth and sing folk music. 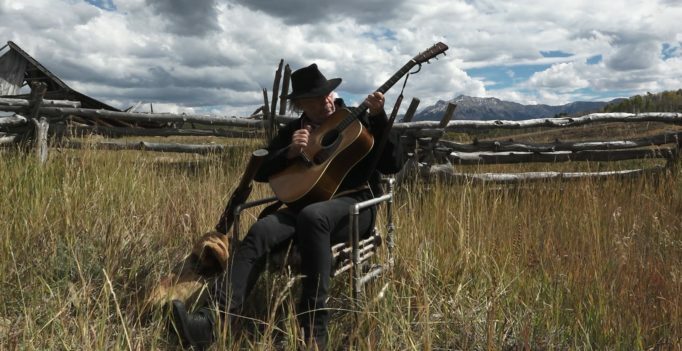 Within close proximity is “The Man in the Black Hat” (played by musician Neil Young), who alternates between being a protector and an intimidator. At one point, he meets up with a man named Red (Willie Nelson) and they rob a seed bank together. Their menacing standoff ends in a chummy exchange as they leave the bank, suggesting that this was supposed to be….funny? I don’t know. Clips from Young’s 2016 Desert Trip live show also appear within the narrative because…..why not? Here’s the predicament: Paradox is review proof. Netflix will chalk this up as a disposable lark (in the same vein as their indulgent mystery movie), and Neil Young fans will flock towards this film despite its cinematic shortcomings. For all we know, that at-home crowd will crank up the volume and do chores while it plays in the background. They’ll only return to scrub through the redundant sketches, and maybe then they’ll actually see how much of an amateur exercise this really is. I feel Daryl Hannah was trying to capture the essence of filmmaker Jim Jarmusch; most notably his eclectic Neil Young concert flick Year of the Horse. However, Jarmusch is a minimalist. He leaves his camera on and focuses in on interesting details that happen organically. Whereas with Paradox, Hannah stages too much clutter to manufacture interest – wrong move, partner.